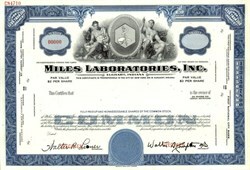 Beautifully engraved specimen certificate from the Miles Laboratories , Inc. printed in 1968. This historic document was printed by the American Banknote Company and has an ornate border around it with a vignette of allegorical men flanking the company's logo. This item has the printed signatures of the Company's officers. Miles Laboratories was founded as the Dr. Miles Medical Company in Elkhart, Indiana, in 1884 by Franklin Miles, a specialist in the treatment of eye and ear disorders, with an interest in the connection of the nervous system to overall health. Miles operated as an independent firm from 1884 until 1979 and as a wholly owned subsidiary of Bayer AG from 1979 until 1995, when it was consolidated into the parent corporation. Specimen Certificates are actual certificates that have never been issued. They were usually kept by the printers in their permanent archives as their only example of a particular certificate. Sometimes you will see a hand stamp on the certificate that says "Do not remove from file". Specimens were also used to show prospective clients different types of certificate designs that were available. Specimen certificates are usually much scarcer than issued certificates. In fact, many times they are the only way to get a certificate for a particular company because the issued certificates were redeemed and destroyed. In a few instances, Specimen certificates were made for a company but were never used because a different design was chosen by the company. These certificates are normally stamped "Specimen" or they have small holes spelling the word specimen. Most of the time they don't have a serial number, or they have a serial number of 00000.